Soon, EVE Online’s free-to-play players will be allowed to expand their spaceship repertoires. CCP Games is more than quadrupling the amount of ships that F2P players are able to fly, still for the low, low price of free. Added last year, the free-to-play mode lets players be active in the EVE universe gratis, albeit with a small fraction of the skill set of monthly paying players. In the game’s lore, this difference in capabilities was explained by the pilot’s clone license: the (free) Alpha State clone bodies were easier to produce en masse, but had limited capabilities compared to the (paid) Omega state clones. With the launch of the Ascension expansion, player groups began the hunt to fill out their groups by attracting these new players, with several major organizations dedicating entirely new recruitment teams to attract and motivate Alpha State players. Currently, Alpha state players are limited to the three most basic ship types, and only those ships which belong to the in-universe racial faction they choose during character creation. A total of somewhere around thirty ships to choose from out of a library of well over two hundreds ships in the game. This limit prevents them from fully exploring the options the game provides, and can force players to create new pilots of other factions just to fly a new ship, which can cause a lack of immersion and attachment. Come December, this is all changing. During the keynote presentation at EVE Vegas last weekend, CCP Rise announced sweeping changes to the Alpha Clone state, which should bring them much closer in line with players with an Omega Clone state, or an active paying subscription. These changes are come in three separate vectors, which should combine to make for a more versatile, more powerful, and most importantly a more satisfied player. The first change to bridge the power gap between a free-to-play player and a subscription-based player is the ability for Alpha Clones to use the advanced weapon systems that they have previously been restricted from. Almost any item in EVE Online has two levels of power: a “Tech 1” variant, useable by players who have minimal training invested in the item, and a “Tech 2” variant, which is locked behind a more dedicated level of training. Tech 2 weapons are more powerful than their baseline equivalents and also allow the use of advanced ammo, allowing the pilot to make more dramatic changes to their firepower and range on the fly. This restriction is being lifted from Alpha clones for all but the game’s largest types of weapons, and CCP has even said it is willing to watch the evolution of Alpha state players and revisit this in the future. In addition to the weapons systems, the December Alpha Clone update will open up two additional classes of ships: the Battlecruiser and the Battleship. Battleships are the largest and most powerful ships available to players in High Security space, as well as some of the most impressive ships visually. They are used daily as the mainline DPS in player vs. player fleets and as PvE killing machines, cutting through hordes of pirates and completing missions for NPC Factions. Access to battleships dramatically changes the options of EVE’s contingent of free-to-play pilots—whether that is bringing some of the largest weapons available in EVE Online to bear against their enemies, or doing PvE content that was previously denied to them because it requires battleship-level power to withstand. This change will surely help Alpha Clones to fully participate in the new Resource Wars events being introduced with the upcoming Lifeblood expansion. Hurricane-Class Battlecruisers converge on a Titan. The smaller Battlecruiser ship type becoming available to Alpha Clones is not something that can be overlooked either. While they are not pound-for-pound as strong as a Battleship, they often come in far greater numbers. Due to the combination of speed, cost, reliability and overall strength of the Battlecruiser, a vast majority of player-run corporations and alliances, (like guilds or clans in other MMOs) have a mainline combat doctrine consisting of this class of ship. One of the most prolific battlecruisers currently is the Hurricane. 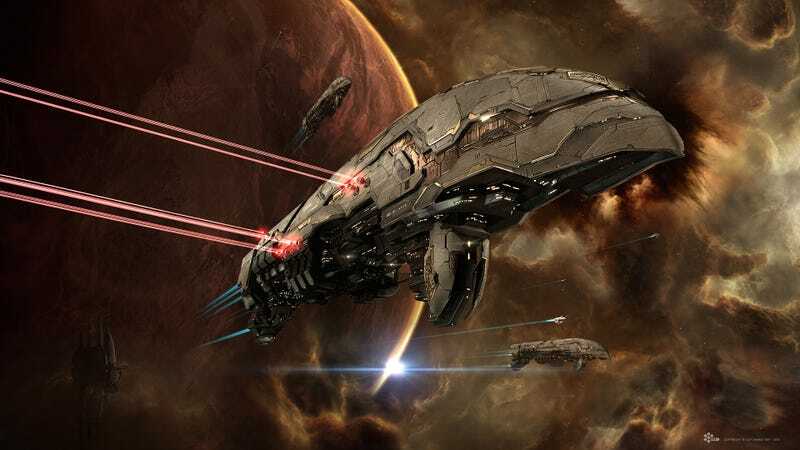 Hundreds of Hurricane-class Battlecruisers fight and die in Null Security wars daily; they are one of the most common vessels seen killing and being killed inside EVE Online. Being able to fly these ships, along with the new weapon system availability, will make Alpha Clones real contenders in EVE’s legendary wars for years to come. As the crowd at the keynote cheered for the changes, and began buzzing with excitement about what this could potentially do for them and their friends in game, CCP Rise announced the final change: All racial ships would now be available to any player regardless of their original racial choice, allowing a player to switch gears if they find another playstyle to their liking. This change alone quadruples the amount of ships that an Alpha State player can access, negating the need for them to make a new character if they want to try a different path. This also allows Alpha players to use the vaunted pirate faction ships, which combine technology of the separate empire’s vessels into some of the most beloved, and expensive, ships in the game currently. Slide from the keynote at EVE Vegas. The caveat to all of this is that no Alpha State player will be able to train up to the massively increased skill point cap for free. After training a total of five million skill points, roughly 2 to 4 months of training time—skill training will stop for alpha state players, and they will have to pay for training time to get beyond this limit. Though CCP is considering adding ways to buy training time in smaller amounts, outside of the 30-day Omega State option currently available. Once a skill available to an Alpha Clone is trained, however, it will always be active regardless of the player’s current clone state. All of these changes combine to bring the Alpha Clone state a significant power and playability boost, helping them become much closer to the level of their peers who pay a monthly fee. EVE Online is reinvesting into the free-to-play crowd, because people seem to be enjoying it. : According to CCP Hillmar, the CEO of CCP Games, the overall EVE Player count has increased by 18 percent since the inception of Alpha Clones, and the company hopes that these changes will bring even more players into the fold.